Several manifestations celebrating St. Sava were held in Chicago and Milwaukee. Celebrations were held at Serbian schools as well as at church parishes. 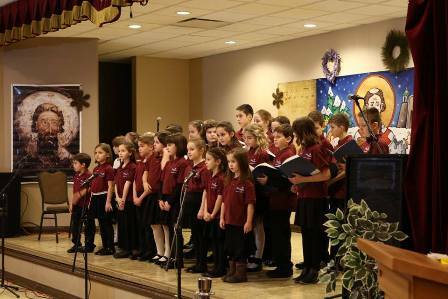 Solemn academies with appropriate cultural and artistic program were held at Serbian elementary schools: St. Sava Academy in Chicago and School St. Sava in Milwaukee. Also, the Academy St. Sava in Chicago organized special reception for the donors and all those who assist and support the work of this school. Acting Consul General Dejan Radulovic attended the reception in the name of Consulate General and on this occasion he expressed his congratulations to the representatives of the Chicago school on the occasion of the holiday and school feast day (slava), as well as to the representatives of the Serbian school in Milwaukee who were also in attendance at the reception. Mr. Borislav Bujeva, Consul General of Bosnia and Herzegovina, also attended the reception. Attendees of the weekly school curriculum from all parochial schools also marked the school feast day (slava) St. Sava with solemn and appropriate programs.